Cake for breakfast anyone? 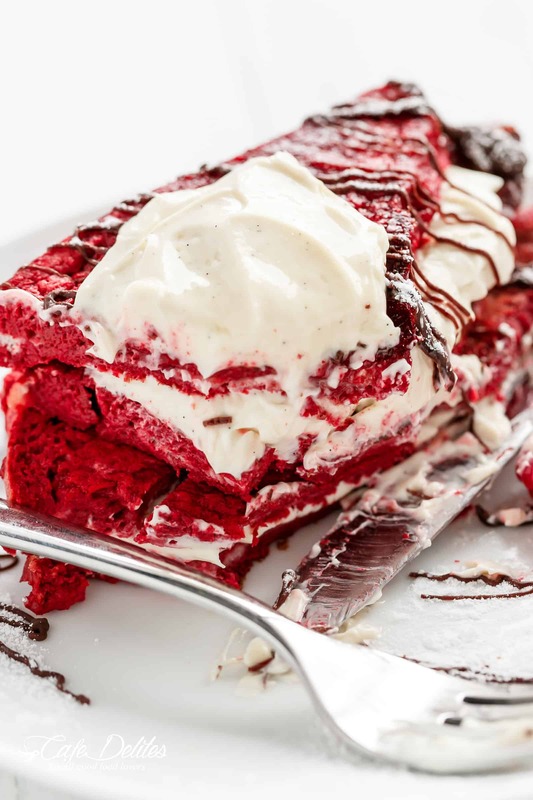 Lately, Pinterest has been swimming with Red Velvet everything. But. One thing I haven’t seen is French Toast. Scrap that. 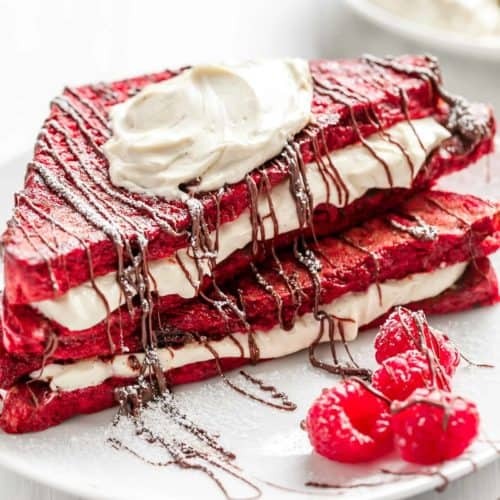 A Red Velvet French Toast Recipe Stuffed with a Creamy Cheesecake Filling! So, I made it my mission to provide you all with the BEST French toast/cake twist! 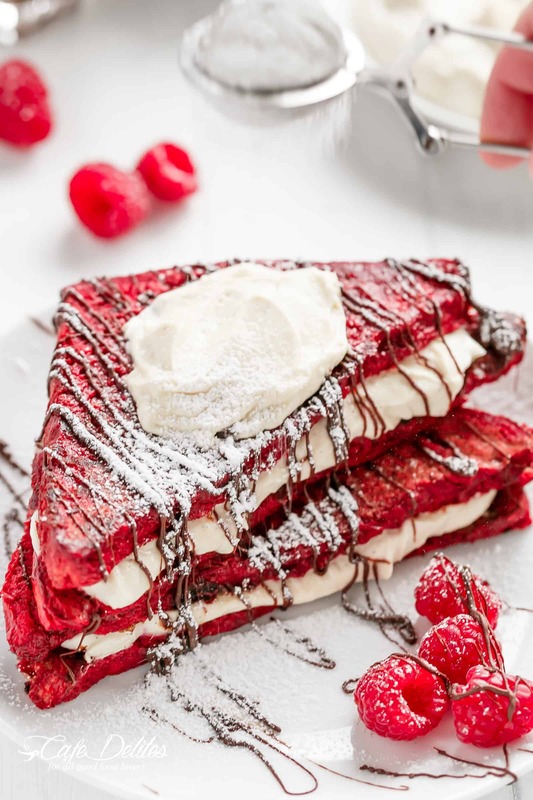 This Red Velvet French Toast happened, well, because cake for breakfast is one of my favourite ways to make French Toast (as you can find here). But then I decided to stuff this one with Vanilla Bean Cheesecake. The no bake kind. 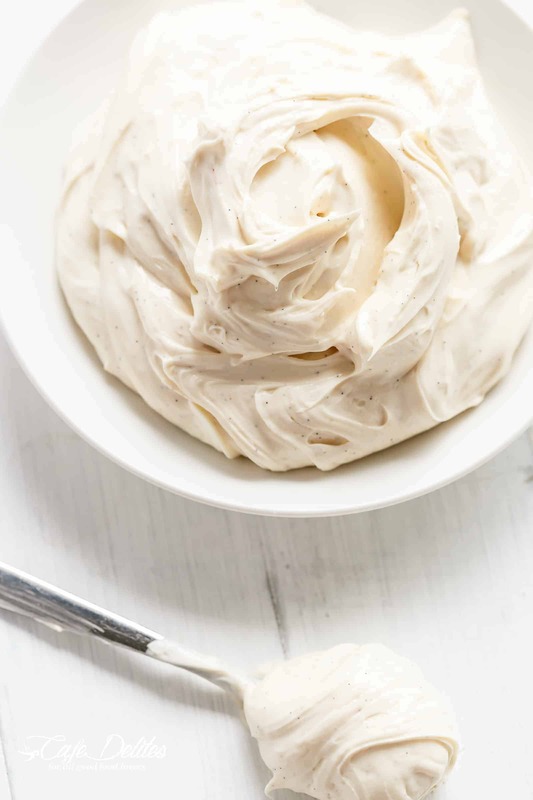 Extra creamy; light and whipped. The most beautiful accompaniment to red velvet. 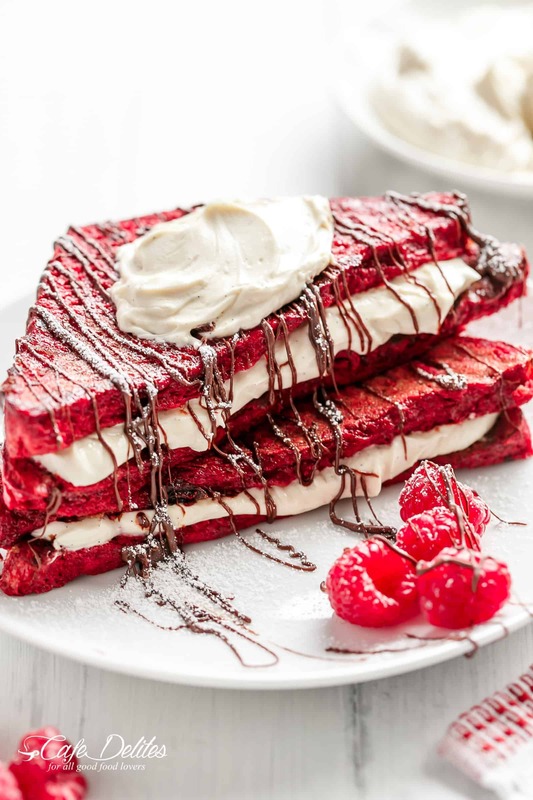 Can you see the red velvet straight through the French Toast pieces? The soaking part (lightly pressing the bread into the egg wash a couple times) works. Mother’s Day or Valentine’s Day never looked so damn good. The first time making this egg wash meant cocoa powder dust flying around the air like it just didn’t care in and up our nostrils. 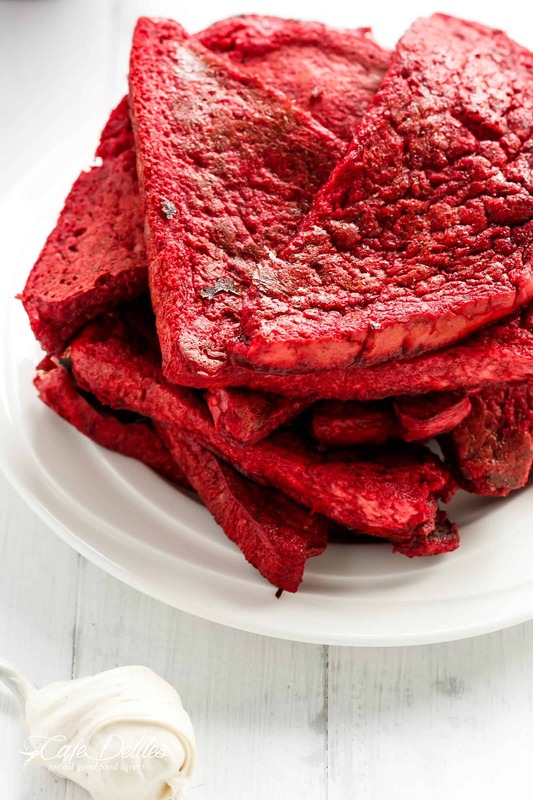 The second time around I dumped all the ingredients into my magic bullet blender — um…minus the bread — and in less than 10 seconds the smoothest, silkiest and creamiest red velvet egg wash was born. Stuff I only dream about. BUT! Normal milk in the egg wash meant a thinner and ‘pink velvet’ finish. With some buttermilk hanging around my refrigerator I tried that instead and like magic, these were coated in the reddest velvet I’ve ever seen besides cake. The good news is they keep their super red colour after pan frying. …or top with extra cream cheese. It just so happens I love all three options. Red Velvet alllllll through the bread. YES! Need more breakfast ideas? Try these! 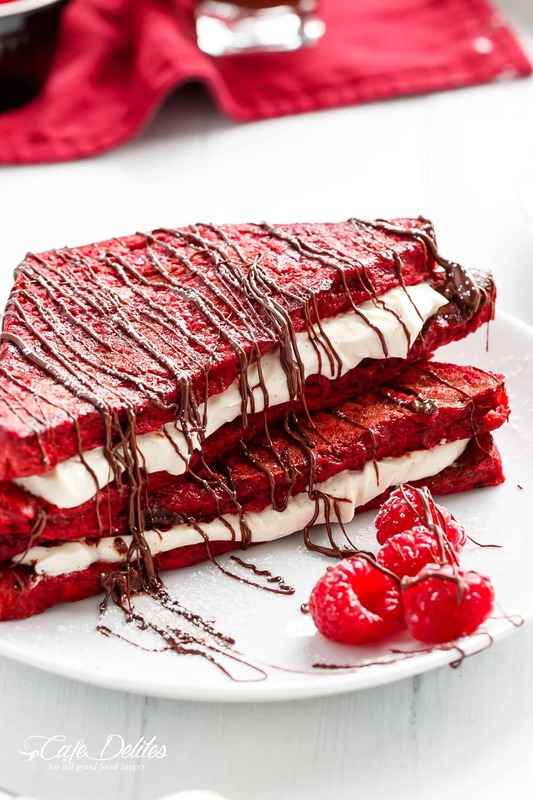 Red Velvet made into French Toast and stuffed with a sweet Vanilla Bean Cheesecake filling! 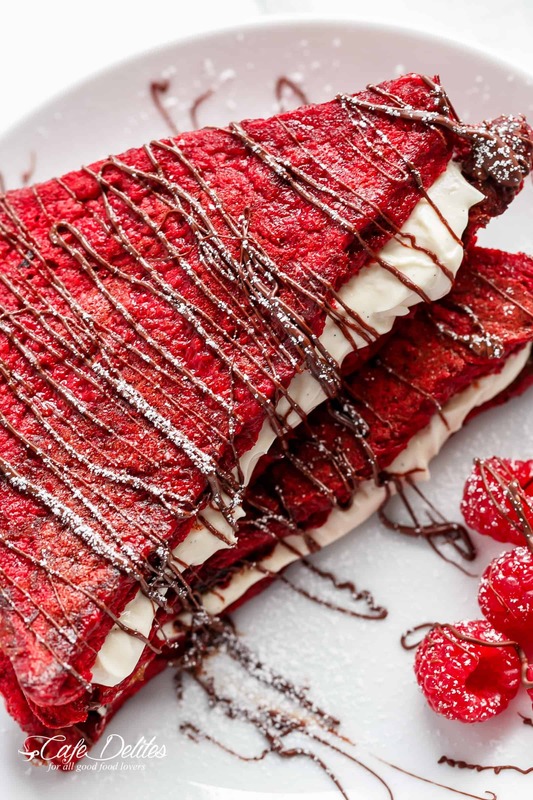 The perfect Mother's Day OR Valentine's Day Breakfast! Weight Watchers: 9pp per serve! (Two French Toast halves including filling).AN ORIGINAL CAFE DELITES RECIPE! Whisk together the eggs, buttermilk, sugar, vanilla, food colouring and cocoa in a shallow bowl until smooth and lump free. Alternatively, combine these ingredients in a small blender or magic bullet cup; blend until smooth and transfer the egg wash to a large shallow bowl. Combine the cream cheese, sugar and vanilla paste in a medium sized bowl, and whip until light and fluffy. Spoon 1-2 tablespoons of filling onto 6 toast halves; spread to evenly coat; top with remaining toast halves to create a sandwich. Drizzle with melted chocolate; top with remaining cream (optional); dust with icing/confectioners sugar and serve with berries. Wow! 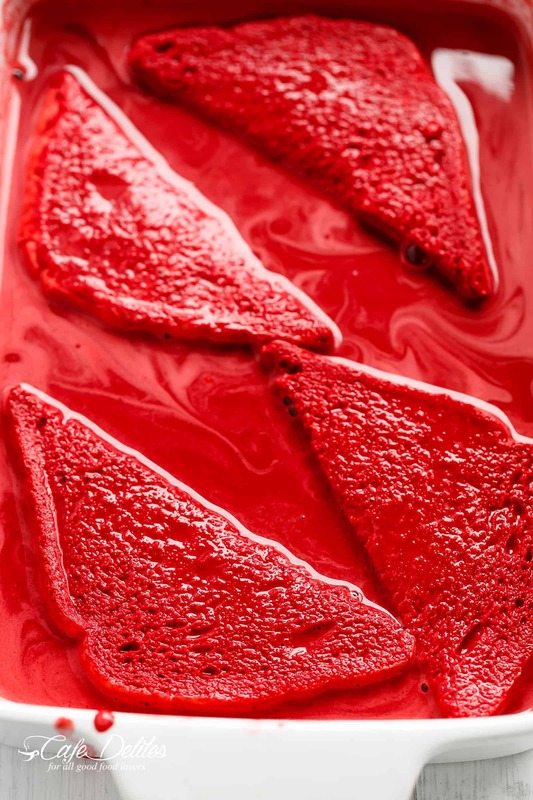 This looks amazing, I never knew such redness on a french toast can be achieved. This is definitely a good threat make on valentines or mother’s day or if you have some free time to whip up such good stuff. Such a fun little idea to share with those you love! Hope you can make them soon! My five year old had red and green pancakes at a Santa breakfast. Now he wants red and green French toast for breakfast Christmas morning! ‘Oh no,’ I thought, ‘I’m not sure it can be done.’ I’m so happy I found this on Pinterest. I will definitely be trying it and modifying this recipe to make some green too! This looks so delicious! 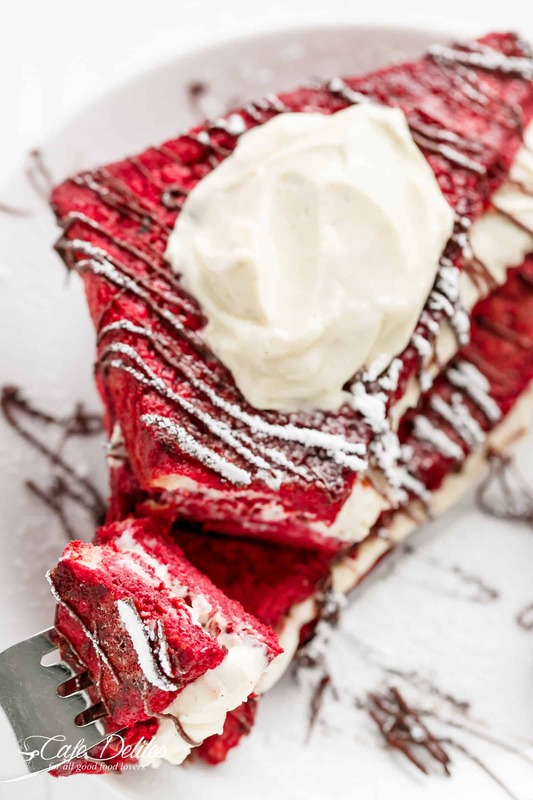 My husband’s birthday is coming up and he loves red velvet, so this will be a perfect birthday breakfast! A quick question, do you just use white bread? Thanks! Hi Jessie! Happy Birthday to your husband! I hope he loves his birthday breakfast! Yes I just use white bread or sourdough for this recipe! This recipe sounds amazing. You really made me laugh talking about the cocoa powder flying up your nose like it just didn’t care. I’m getting this recipe just in time for Valentine’s Day. Yay! Thank you! We love this recipe and wanted to know if you are working with any Matcha Brand because we would love to sponsor your next recipe that uses green tea matcha, please let us know if you are interested in our organic culinary matcha. Sure. Please email me at [email protected] and I can send through my media kit.